One of the things I love about my husband is that he's always doing little things that make my life easier. We needed a sun shade on the baby's side of the car, and something on the back window for her rear-facing view. I had tossed the latest yard-sale window shade in the trash. Seems like the suction cup was a magnet for preschool mischief; when the shade wasn't falling off, it invited smeary spit marks all over the glass. 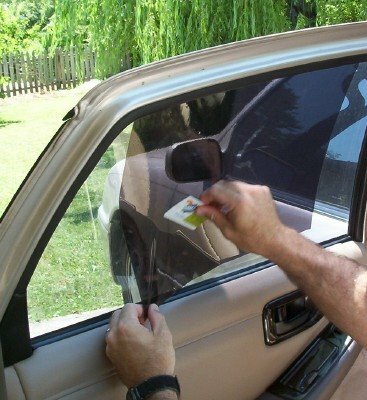 Frugal Dad came to my rescue with a roll of tinted window film from Walmart. It cost about $10 and contained enough to make four generous squares--one on each rear window and a long panel along the back. A premade version probably exists, but cutting our own allowed us to tailor the shade to our car's windows. The film can be peeled off and reapplied anytime after washing the glass with soapy water. I think the visibility is better, and the windows can be rolled up and down. A wonderful use of a Sam's Club card as well. hehe! Dawn, I was wondering if anyone would notice the Sam's card! Ha! I'm glad to know this as I have tried the suction window coverings and they just don't work that great. Thanks for the idea! This is a great idea...I'd never looked for this product at Wal Mart.